BikeCityGuide is the first bicycle App - especially for city + environment! Real time route calculation prefers bike-friendly ways. With precise voice messages and without active data connection, saves battery and roaming costs. Absolutely safe bike mount + Navigation App for Smartphones + free voucher code for a navi-city kit of your choice! Made of high-strength silicone (very stretchable and sturdy) - resists every shaking! Quick mounting - suitable for every bike handlebars and every Smartphone! Navigation works offline - active data connection is not necessary (no roaming costs abroad!). *Overview of all activated, selectable cities (of it, among others, Berlin, Hamburg, Munich, Cologne, Amsterdam, Brussels, Zurich, Vienna, Barcelona, and many more). BikeCityGuide App is available for free at diverse App-Stores like Google play, Apple App Store, etc. 1. Load the "BikeCityGuide" in your App store and select your city in the App. 2. Click on "Installieren" (install), select the option "Gutschein" (voucher) and enter the voucher code provided in the product. 3. After the download, your city is available without active Internet connection. Every other city pack costs 4.49 € one-time - if not stated otherwise - or can be activated with the voucher code. Any city pack can be installed for free for testing and be used for 30 km. Bikes as well as Smartphones illustrated on product photos are not included in delivery! 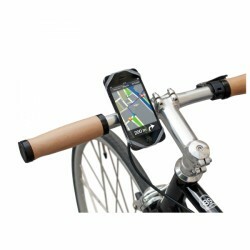 Developed by cyclists - for cyclists: The bike mount FINN and the navigation App for Smartphones! The Bike mount FINN incl. bike-Navi-App (Sport-Tiedje Edition) fixes your Smartphone on each bike handlebars in a safe and stable way. The mount, made in Austria, resists everything - being of smart, simple design and made of high-strength silicone. Another highlight is the navigation App for Smartphones, which is especially designed for needs of cyclists in cities. No matter whether you want to discover the city or get navigated to a certain target: with the bike navi App of BikeCityGuide, you find the most bike friendly route, which prefers bike paths and side roads and avoids busy main streets. In addition, the bike navigation is accompanied by voice messages, which work exactly even for complicated turnings. It makes cycling across the city more comfortable and safer. The BikeCityGuide Cycle-Navi-App knows many sights in every city, which you can discover on preset city tours. When you prefer more individual onces, you can also easily create your own tours. Many functions of BikeCityGuide, especially bike navigation and route planning, can also be used without active internet connection. You save roaming costs abroad and the battery lasts longer. Doet precies wat het belooft. De gsm blijft keurig en stevig op de juiste plek zitten. Onder het fietsen kun je je gsm gewoon bedienen en bijv. je route bijstellen. En je kunt het heel eenvoudig aan het stuur vastmaken en loshalen. Näppärä "teline", tosin yhdistelmä paksu ohjaustanko ja 5,5-tuumainen puhelin venyttää sen äärimmilleen. Yksi vastaava katkesi, kun yritin venyttää kuulokeliitännän yli. Silti puhelin pysyi kolmella kiinnityskohdallakin kiinni.